NEWS HIGHLIGHTS FROM 1960 Castro & Cuba Fidel Castro takes Cuba further down the path of communism, and goes completely anti-American, seizing nearly all U.S. Owned property in Cuba. The Cuban Premier begins a series of meetings in Moscow with the only man who can help bail out economically shattered Cuba. He also smokes a Russian cigar. How does he like it? Nobody's talking. Moscow, Russia Fidel Castro walking inside a building holding his hat in his hands. MCUS - Fidel Castro walks up to Nikita Khrushchev and a warm welcome hug is given to him by Nikita Khrushchev. CUS - Nikita Khrushchev CUS - Fidel Castro MCUS - Khrushchev cabinet members sitting at a conference table smiling at Castro and Khrushchev MCUS - Khrushchev smiling at Castro as he puffs on a Cuban cigar. Castro Rebuffed. In response to the calculated hostility of Fidel Castro's regime, President Dwight D. Eisenhower cuts Cuba's assigned share of the U.S. sugar market by 95%. Good news to other world sugar producers, but a costly blow to Cuba which receives a premium over the world market price. Castro is expected to react to the $92 million loss with new seizures of American property. MS - Ike speaks (no nat sound) at White House press conference. Reporters take notes. MS - Cuba men hack away at plants with machetes. Harvest. Farmers transport the stuff via carts drawn by cattle, also by tractor. CUS - Field hands really cutting away. MLS - Oxen pulling sugar cane that's laying on a wagon. MS - Two men sitting on a tractor pulling sugr cane wagons. Fidel Castro, ordered by doctors to take a complete rest from his activities as leader of Cuba's revolutionary government, temporarily steps out of the spotlight. He's shown in one of his last public appearances at the celebration of his movement's 7th anniversary. Brother Raul Castro, Fidel's heir apparent, is shown receiving a red carpet reception in Moscow, from which he hastened back to Cuba. Parade in Cuba, men march with flag, women parade. Cuba's army and citizens in a walking parade. MS - Fidel Castro standing on a podium. MS - Castrol's brother Raul on a podium in Moscow, Russia. CUS - Soviet audience applauding. MCUS - Raul hugs some Soviet woman. Again: Premier Fidel Castro makes an appearance before the Pan-American Youth Congress in Havana and announces the seizure of three quarters of a billion dollars of U.S. property in Cuba. Though ailing, Premier Castro is still an imposing figure in the Cold War. An ailing Fidel Castro standing high up on a podium wearing his army clothes, smiling and waving to the people. MCUS - A delegate from Panama holding up a Panama banner. MCUS - Another delegate from Venezuela holding up a banner. Camera panning the crowd - People waving and smiling at the camera. MSLU - Castro on the podium or reviewing stand waving and smiling. Mr. K And Castro Arrive In New York An impressive parade of world leaders arrives in New York for the opening of the 15th general assembly of the U.N. First is Cuba s Fidel Castro, who is received with mixed cheers and jeers. Russia's Nikita Khrushchev soviet ally and satellite-to be greeted by furious protests of demonstrators, many of whom are east European refugees. In all, 20 heads of state will be represented in one of the most dramatic sessions. US Breaks Relations With Cuba Fidel Castro stages the biggest military parade ever seen in Cuba, featuring modern weapons from Russia. 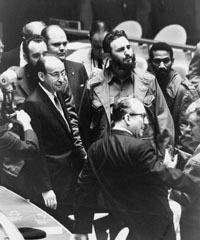 Shortly after the martial celebration of the 2nd Anniversary of his regime, Castro demands a drastic cut in diplomatic relations by President Eisenhower. Red Crowds Celebrate May Day The may day celebration in Moscow gives the Russians a chance to crow long and loud over the west - for the theme running through the parade is their triumph in space. The guest of honor, of course, is Yuri Gagarin, first man to orbit the earth. Nikita Khrushchev stands next to Gagarin as he waves. Rocket balloon released in his honor. Floats including a picture of Lenin. Nikita waving hat, and Yuri waving. The face of a peoples whose leaders would wipe out democracy. Closer to the United States - 90 miles away to be exact - Fidel Castro takes the occasion of May Celebrations to dictate that Cuba is a Socialist party. Parade and Castro floats. Crowds. Cuba In Crisis: Castro Attacks U.S. As Opposition Rises. Cuba In Crisis: Castro Attacks U.S. As Opposition Rises. A rising tide of opposition confronts Fidel Castro. After anti-revolution leaflets rain on Havana from the air, and terrorist raids wound 45, killing 2, he takes to the air for a 5 hour broadcast, denouncing the United States for harboring his foes, and summoning a rally of one million peasants. Crowds outdoors. Papers blow along streets. Injured man being attended in hospital bed. Massive rally with huge crowds, banners, flag. Castro in TV studio, talking at microphones, and of course gesturing. First films from the mountain stronghold of Cuban rebel leader Fidel Castro, made just before fighting erupted across the island. Scenes show the ragged but determined rebel band in their daily life, making their own weapons, and waging the sabotage campaign that paralyzed all of Oriente Province. Fidel Castro and his ragged force gathered around him. MCUS - Castro wearing glasses speaking to some of his people, one lady is holding a baby. MS - Castro's men in a jungle work-shop making some of their weapons. CUS - Some of the home-made grenades - they have wicks sticking out of them. The resemble a huge firecracker. MCUS - Men working at a Mimeograph Machine printing out propaganda. MCUS - Another of Castro's men sitting at a radio sending and receiving messages. MS - Two men eating some kind of meat that has been cooked outside. MS - Castro briefing his men from a map laying on a make shift table. MCUS - Fidel Castro's rebel army, sitting with their rifles in hand and smiling. MCUS - Fidel Castro standing with some of his army men dressed in army fatigues and holding rifles. MS - Fidel Castro stand with his men in the midst of a Cuban jungle. MS - Fidel Castro coming up a hill holding his rifle and his men are following him. MS to MCUS - Fidel Castro fighting in the jungles of Cuba. From the ground up looking at Fidel Castro and his rifle in hand. CUS - Fulgencio Batista and his family. Castro's Triumphant March In Cuba Havana cheers provisional President Urrutia, while rebel leader Fidel Castro completed his triumphant march across the island - jubilantly hailed in every town and hamlet. The bearded, cigar-smoking Castro has become a living legend in the role of hero. Enthusiastic throngs rush to see and viva the man who overthrew the Batista dictatorship. Street scenes, guerrillas with weapons. Men and women sitting on a tank wave to camera. Urrutia (?) speaking at microphones. Crowds applaud, cheer, wave as Castro travels by. Castro speaks and gestures. Havana Crowds Hail Castro Success "Fidel Castro's 2-year guerrilla revolt against Cuban dictator Batista triumphs with Batista's flight. As the first rebel units enter the capital, Havana, crowds storm the streets - first in tumultuous rejoicing and then in angry demonstration against reminders of the ousted regime." Castro with other men (presumably fellow guerrillas) outdoors, talking. Men with guns; Castro holding gun. Somewhat motley crew of guerrillas in streets, some with weapons, including men on tank. Celebrations in streets, mostly young people, cheering, some with flags or banners. Men destroy what looks like furniture in the street. "Head" of parking meter (?) lying on the ground. Men stop another man with a big stick from pounding anything; one gently takes it from him. Man holds up newspaper; part of headline says, Fue Batista. Crowds. Vast Throng Hails Fidel Castro Scores of thousands massed outside Havana's presidential palace, roaring their approval - as the Cuban rebel leader asks if they favor executions of Batista supporters, accused of war atrocities. Vast, huge crowd with banners. Fidel Castro speaking into microphone, gesturing in typical fashion. Crowd applauding. Cuba's Castro In New York The man who led the revolt against the Batista regime arrives in New York's Penn Station and is greeted by some 20,000 cheering Spanish-speaking worshippers. He is very touched by the demonstration. Fidel Castro gives New York's 'finest' a real work out. Real tough assignment for the New York policemen - guarding the controversial Castro - whose secret formula for charm seems to be maximum courtesy, minimum information. Crowd waves flags (Cuban?). Castro amid people, microphones near his face. Police wrestle a man in crowd, take him away (without much struggle). Castro waves and flashbulbs pop. 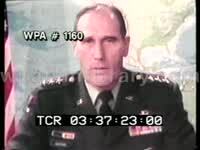 Elevated GV of Adlai Stevenson speaking at UN Security Council meeting. Aerial LS fleet of warships at sea. Aerial fly by over three warships at sea. Aerial of aircraft carrier at sea. GVs fleet of battle ships at sea. Cuba: MS Cuban soldiers in tank. CU tank guns. LS pan of Cuban street fortified with sandbag barriers. MS Cuban man with a gun. GV building facade with Cuban flag flying. GV building facade pan down to armed man at sandbag barricade. Low angle GV looking up at armed guards on roof of building. GV pan of armed military behind sandbag barricades along the Cuban coast. MS Cuban military with antiaircraft gun. MSs soldiers marching. MS Cuban women marching in protest. GV pan of crowd at rally. MS profile of Fidel Castro talking into microphone at rally. MSs/CUs U.S. military loading film into large camera mounted on front of airplane, the high power lens is cleaned. Aerial of plane in flight. MS inside plane as man operates camera. Aerial reconnaissance photographs of missile site and surface to air missile depot. MS's & CU's of FIDEL CASTRO and CHE GUEVARA looking over maps. MS Soviet General Secretary LEONID BREZHNEV posing with President Gerald Ford at Finland Summit, 1975, Mr. Brezhnev making funny though aggressive nudging motions at Ford's ribs; detente. Quick MS Leonid Brezhnev meeting with Cuban Premier FIDEL CASTRO in Red Square, Moscow. MS Mr. Brezhnev sipping champagne with President RICHARD NIXON in Moscow, 1972. Various shots of Helsinki Accords conference, 1975. FIDEL CASTRO walking down a HAVANA street. Newsreel of Yuri Gagarin being received and honored in Havana, Cuba: FIDEL CASTRO greets him at airport; huge crowds as motorcade drives down a flooded street en route to an outdoor function. Fidel Castro, in fatigues, and aides marching through street. Fidel Castro speaking in the United Nations. Fidel Castro speaking at outdoor rallies, mid-70's and early 80's. VO asserts Central America is vital to American security (Domino Theory). Nicaragua. Soviet-Russian artillery on parade. Soviet issued helicopters in flight. Fidel Castro and Daniel Ortega reviewing a Sandinista military parade. Soviet issued tanks on parade. Soldiers marching in military parade. Fidel Castro saluting while standing next to Daniel Ortega during military review.